So. I've had this first recipe since 2005, but last evening was the first time I made it. Shame on me. I guess it makes sense, though. Four years ago, I didn't have copious amounts of pesto in my freezer. Or chicken in my neighbor's freezer. Some things just work out, I guess. I totally forgot to take a photo of the fettuccine and we almost ate it all, even with me doubling the recipe (brother, Ben, and future sister-in-law, Kim, helped out, too). The little bit that was left wasn't very photo worthy. It did look very similar to the photograph in the magazine, though, so here it is. Don't worry, I'll re-type it for you so you don't have to squint. This was extremely easy to make and very tasty. I highly recommend it. Pound the chicken breasts to 3/4 inch thickness. Season with salt and pepper. Heat oil in non stick skillet and cook the chicken until golden brown and cooked through. Slice each piece across the grain into 4 or 5 strips. Cover to keep warm. Meanwhile, cook pasta according to directions. Reserve 1/4 cup of cooking liquid. Drain pasta and return it to the pot. In a small saucepan, heat pesto over medium low until liquefied. Stir in cream and heat until warm. Toss the pasta with reserved cooking liquid and half the sauce. Divide among shallow bowls, top with chicken and drizzle with remaining sauce. 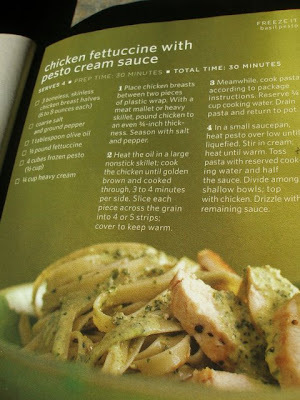 My notes: I used already cooked chicken and just added it to the sauce before adding the sauce to the pasta. I didn't have heavy cream, so I used plain yogurt and it worked just fine. I served it in a large bowl with parmesan cheese. 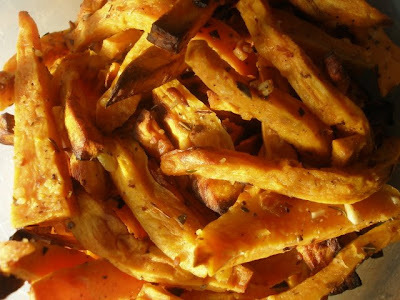 On the side, we had Sweet Potato Fries tossed with olive oil, lemon juice, oregano, minced garlic, parmesan, salt and pepper (spread out on cookie sheets and baked at 400 degrees for about 35 minutes). It's another adaptation from Simply in Season. if you like this recipe, you should try making basil noodles. I just made some last night and my husband gobbled them up like he hadn't eaten all day (but maybe that's because he really didn't eat much all day!) Just find a pasta recipe that you like (we prefer one that doesn't have too many eggs...I guess we don't like the eggy taste in our noodles) and then add some chopped basil that has been frozen in oil (like MamaJJ does it...she mentioned it on her blog). Mmm, those were tasty noodles and I'm sure they'd be extra scrumptious with that chicken on top! Wow...I'm hungry now! Everything looks so delicious...you spent some quality time in the kitchen yesterday. I read somewhere something about being more healthy and saving money...it said, "Spend more time in the kitchen" and it's so true...and fun! I've been making muffins often for snacks for the family (inspired by The Shopping Cart Challenge, do you read her? )...it's great because I know the ingredients that they're eating...way more healthy AND cost effective. It makes me feel like a good mom! Thanks for this recipe! My son said it was the most delicious dinner ever! I love sweet potato fries, they always seem to turn out a little soggy for me though... any tips? I have never been able to get sweet potato fries to be as crisp as regular fries (without actually frying them- I don't fry). I think we just need to adapt our expectations of them:-). I think making sure they are well-baked/with black-tips even helps them from being too soft. Just remember to turn them often!